This year we took Halloween booing to a whole new level and decided to boo our good friends with some edible ghosts neatly placed in an edible family friendly graveyard. My entire family enjoyed this activity – the best part was booing our friends with this delicious treat. While at the library, I was briefly looking through a book about fun Halloween ideas. When I read about a ghost shaped rice crispy treat, I had to make this with my children. In a large pot, melt marshmallows and butter on medium heat, stirring frequently. Gradually stir in rice crispy cereal. Use 1/2 to 1 cup of mix to form the ghost. Note: Wet your hands before forming to avoid a sticky mess!! Let the ghosts cool completely. Dip each ghost into white candy melts (Note: Do NOT use white chocolate it does not melt! Michaels, the arts and craft store, sells white candy melts which worked perfectly and tasted good too). We used milk chocolate morsels for the eyes and cut up a tootsies roll to use for the mouth. 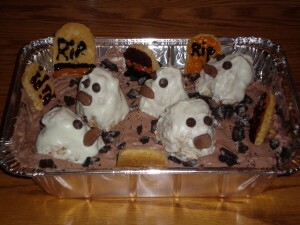 Using the dirt dessert recipe, we decided to get real creative and made a family friendly graveyard. We cut sugar cookies to look like tombstones and wrote “RIP” using gel food colors. Here’s what you need to make dirt. Crush Oreos and put about a third of them in the tin pan. Set aside. Combined cream cheese, butter, sugar and vanilla. Set aside. Combine milk and pudding mix and then fold cool whip into the pudding. Fold together the pudding/cool whip mixture and the butter/cream cheese mixture. Layer the combined mixture onto the Oreo cookies in the pan. Add more crumbled Oreo cookies and then the remaining pudding / cool whip mixture and then top with the remaining crumbled Oreo cookies. 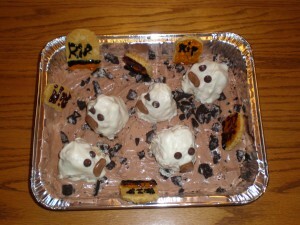 We placed the ghosts and tombstones on top of the dirt dessert. My family had a wonderful time making these Halloween recipes. Source: Better Homes and Garden Books (2001). Halloween Fun. Des Moines, Iowa: Meredith Corporation.